Posted on November 11, 2014 by Hawaii's Local Buzz. Choose your alcohol. 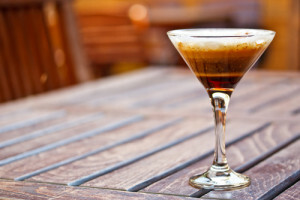 To make a smooth, Kahlua-style liqueur, choose a high-quality, unflavored vodka or white rum. To make a darker, richer coffee liqueur, choose your favorite Scotch whiskey. In either case, choose a liquor that you enjoy drinking, as its flavors will be a part of the final product. Choose your coffee. Freshly roasted, high-quality coffee beans work best. Pick a coffee that you enjoy warm, and you’ll also enjoy it in your liqueur. Experiment with different roast levels — we have three different roasts to choose from (Light, Medium and Dark). Make your steeping mixture. Grind enough coffee beans to make 1/2 cup of ground coffee. Add 2 cups of your alcohol of choice, along with a splash of vanilla extract and a teaspoon of agave nectar. Let it steep. Allow the coffee to impart its flavor into the liqueur. Seal it in a glass jar, and let it rest for 24 hours at room temperature. This long steeping process will urge the more subtle flavors to come out of the coffee. Strain the liqueur. Pass the mixture through a sieve to strain out the coffee grounds. Then, store it in a glass jar or bottle, and enjoy. Your coffee liqueur will be delicious on its own, or mixed into your favorite cocktails. Try adding additional ingredients like a pinch of cinnamon or nutmeg to the steeping mixture to create new flavors. For the best Hawaiian Ka’u coffee to use in this and other recipes, visit Hawaii’s Local Buzz, your source for macadamia nuts, chocolate, coffee, and other Hawaiian treats.